The Long Beach calf taking a peek. Photo: Robin Eckermann. Long Beach locals have been spellbound over the last fortnight by a 16-metre long mum and her 6-metre baby. It wasn’t a family from Canberra but rather two Southern Right Whales, who appeared to be comfortable and at home in the sapphire waters north of Batemans Bay right up until last weekend. Resident Sue Middlebrook is encouraging anyone with a view of the ocean to keep an eye out for the whales (an endangered species) as they look for their next safe harbour. “It’s possible she returned [to Long Beach], her birth spot, to give birth herself. She kept onlookers entertained with ‘training’ sessions,” Ms Middlebrook told About Regional. This Southern Right Whale spent around 12 days in Long Beach before being frightened off. Photo: Peter Bennett. The region is right in the middle of calving season for these giants, with the season running from June to August. Mothers use the winter months to teach their babes the skills they will need for an Antartic summer. The NSW Government’s Wild About Whales website estimates there are around 12,000 Southern Right Whales spread throughout the southern hemisphere, while the World Wildlife Fund suggests the population unique to Australian waters is around 3,500. This is in stark contrast to the species pre-whaling population of more the 100,000. Protected in Australian waters since 1936, numbers are growing at around 7% per annum. Given the whales’ lifespan of around 100 years, Long Beach is sure to get another visit from this pair. Photo: Peter Bennett. Long Beach locals ‘oohed and aahed’ as they witnessed the rebuilding of this fragile population, but were equally disappointed when the interest of some seemed to drive this good mum and her precious baby away. “The fine weekend brought out the boating and jet ski visitors, there were at least two close encounters, well inside the 300-metre exclusion zone for watercraft,” Ms Middlebrook says. “Mum appeared to be unsettled and by Sunday (July 1) they had left. The Long Beach Community Association has been quick to remind people of the rules that exist around whale watching on their Facebook page. If a whale approaches your vessel do not suddenly change speed or direction. 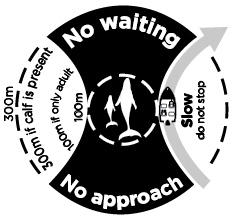 Slow down, engage neutral and wait until the animal has moved beyond the approach distance. Then, travel at a constant slow speed until you leave the caution zone. When it comes to aircraft, similar exclusion zones apply. 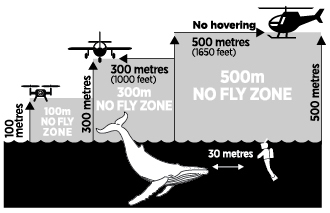 Drones which are becoming a common sight along our beautiful coastline must not hover below 100 metres or get below 300 metres if a calf is present. With the peak of the Far South Coast whale season still to come in September, October and November, and whale numbers increasing, understanding the rules is key if you want to avoid on the spot fines and grumpy locals. Southern Right Whales are one of the longest living creatures on earth – generally notching up 100 years – and so chances are that Long Beach locals will see this mother and calf again. Spotting any whale is a thrill. In the waters of the Eurobodalla and Bega Valley, Humpback Whales are “the stars” and the most commonly sighted, meaning that spotting a Southern Right holds a special thrill. According to Wild About Whales, Southern Rights can be identified by their two separate blow holes which produce a distinguishing V-shaped blow. “Southern Rights have an enormous head which is up to one-quarter of total body length. “The callosities on the head are made of hard material, similar to human finger-nails, which appear white due to large colonies of whale lice called cyamids. The number, shape and position of the callosities are unique to each individual whale, and allow us to tell them apart. 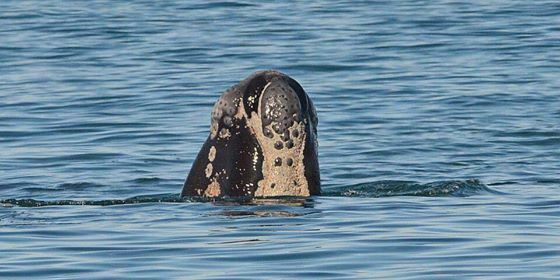 “Southern Right Whales tend to have a large callosity at the front of the head, called a ‘bonnet’,” Wild About Whales says. If you see people, vessels, and aircraft breaking the state’s whale watching rules the Long Beach Community Association advises you to contact the NSW National Parks and Wildlife Service State Duty officer on 9895 7128 or ORRCA’s 24-hour Whale and Dolphin Rescue Hotline on 9415 3333.